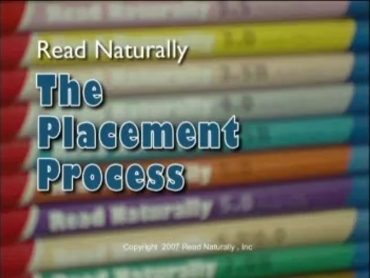 How To :: Video: Placement process for Read Naturally Strategy programs :: Read Naturally, Inc. This video walks you through the placement process for Read Naturally Strategy programs (Read Naturally Live, Encore, Masters Edition, and Software Edition) Although the video shows placement in a Read Naturally Masters Edition program, the the placement process is similar for other Read Naturally Strategy programs. When you place a student, you choose an instructional level, set a reading-rate goal, and choose a curriculum that is appropriate for him or her.